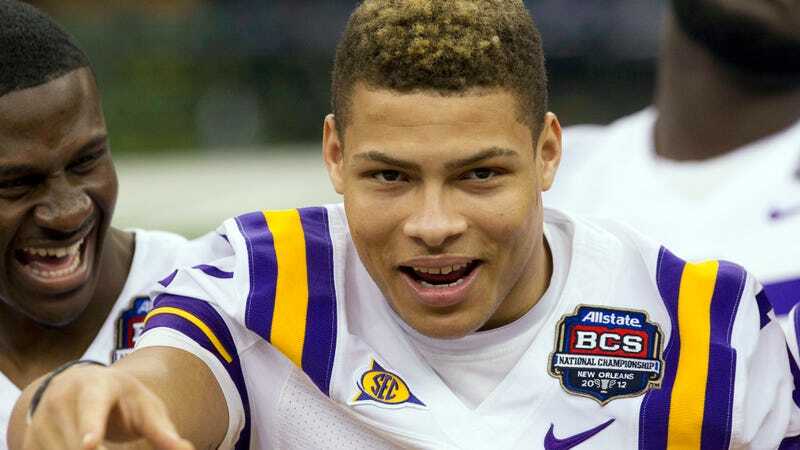 LSU defensive back and return man Tyrann Mathieu will not return to the Tigers this year, as announced by head coach Les Miles at a press conference in Baton Rouge today. The Honey Badger, who finished fifth in last year's Heisman voting and became a favorite of Brent Musburger, was the subject of an odd ESPN The Magazine piece published online this week that mentioned the magazine's failed attempts to talk to the athlete. The article also noted the school was not promoting Mathieu with a Heisman campaign, an oddity for a returning athlete who was already a finalist. Mathieu was suspended for a game last season by LSU after allegedly testing positive for synthetic marijuana. When asked today if Mathieu was being dismissed for violating a team rule or university rule, Les Miles answered "Both. They're synonymous." LSU is ranked No. 1 in the preseason coaches' poll.